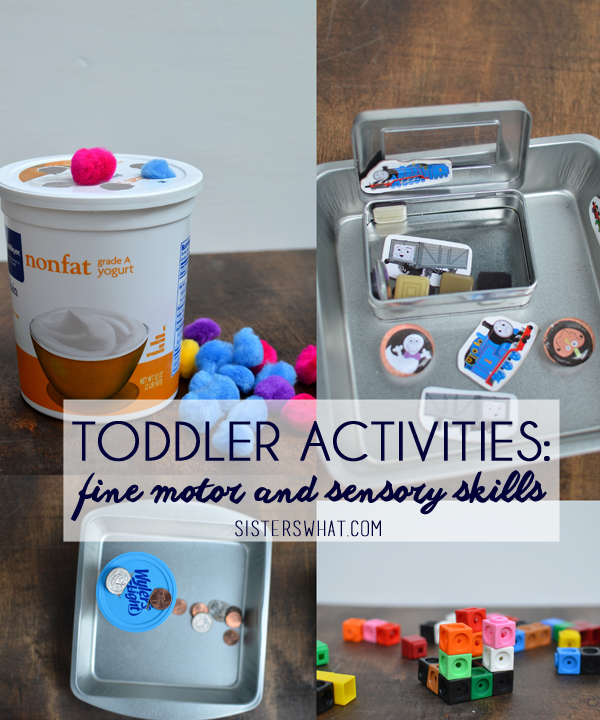 ' Toddler Activities Part 1: Perfect for Traveling or Quiet Time Part 2 Toddler Activity Post - Sisters, What! This post may contain affiliate links (opinions are 100%, ours, if I didn't like it I wouldn't share it). Thanks for supporting Sisters, What! Can you believe it's already August?? Seriously, is Summer really almost over? I'm not going to lie, though, we had a cloudy day a couple weeks ago (usually we have more in the PNW in the summer time) and I suddenly got excited for the chilly weather of fall. Ya, I really love the rain and totally miss it. Anyway, a couple weeks we drove 12 hours to California for our big summer trip. Ok, that really not that far, but with kids...ya know how it is. Our kids are really good in the car. They're used to driving 2 hours to visit grandparents, but 12 hours is a lot further than 2 hours. We did a 12 hour trip for last Thanksgiving, so I knew they would be fine, but it was still rough. This time round I decided to come up with as many activities as possible that didn't take up much space. Yes, we drove 12 hours with 3 littles in a hondo civic. Are we crazy? probably. Did we survive? somehow and with flying colors. And here's the best part: We didn't break out the DVD player once. I know totally crazy right? I still can't believe it. Ok, so we did break up the trip by doing A TON of stopping, but we really wanted to see how long the kids (and us) could make it in the car without any digital assistance before everyone went crazy. Call us crazy, but our parents did it with us as kids so we figured we give it a shot. I'll go over details of our trip later, for now, I'm going to share this week some of the activities I scrounged up to keep the little ones busy. These are actually on loan from my mom. She bought them for me and my siblings when she home schooled us. So, they're probably about 20 years old. 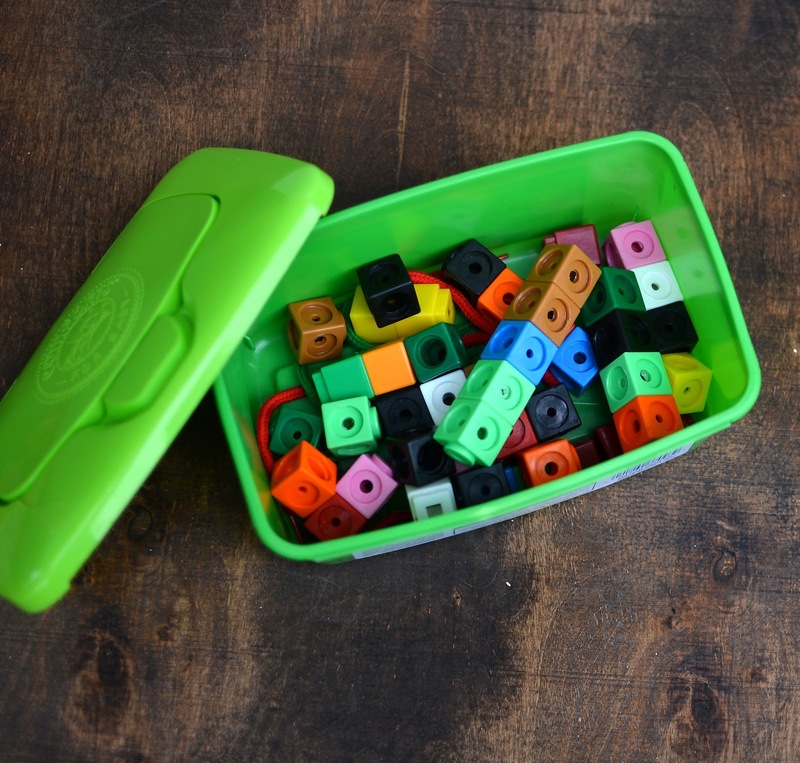 I can't find these specific brand for sell, but you can get a set of Math Link Cubes on Amazon for a really great price. 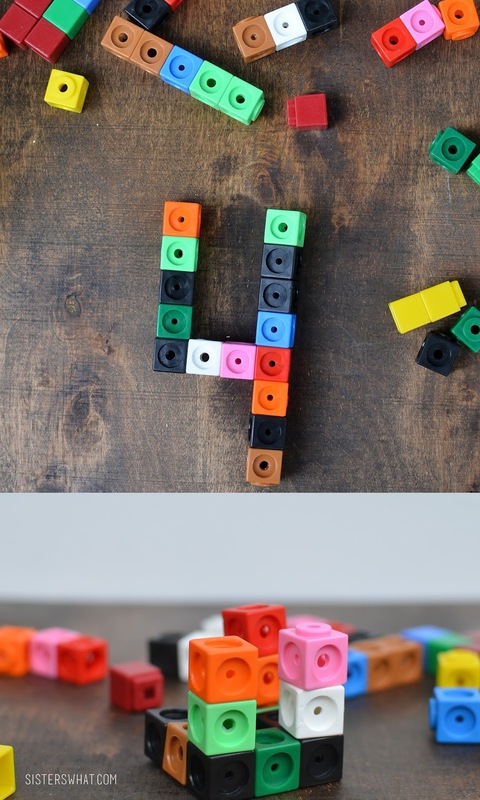 These cubes are really awesome. Like so awesome you'll probably find your husband playing with them by himself because he didn't notice the kids had wandered off. 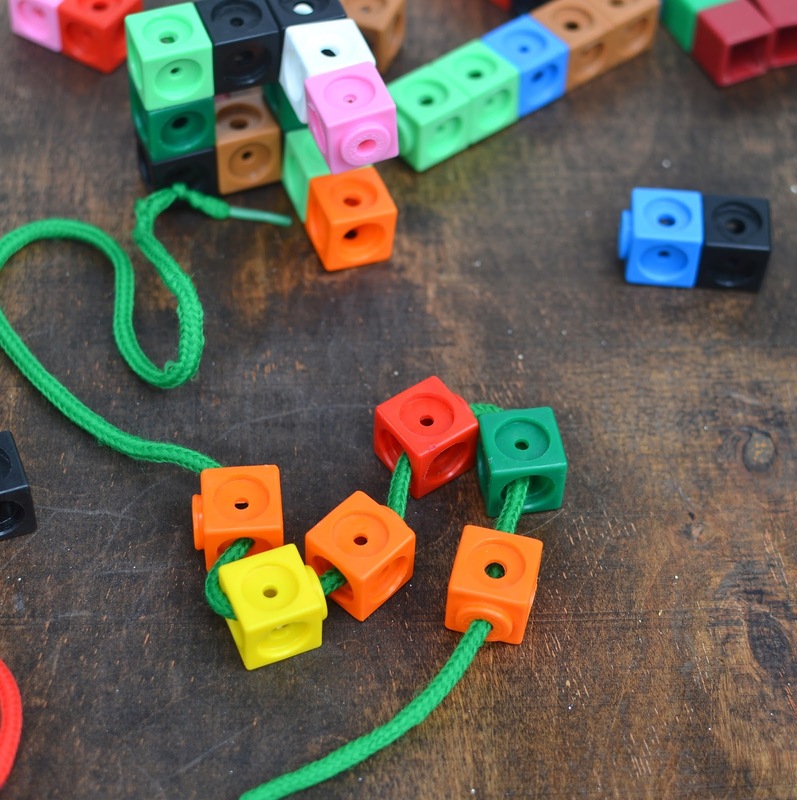 You can build 3D objects, string them like beads, match them up by color, etc. 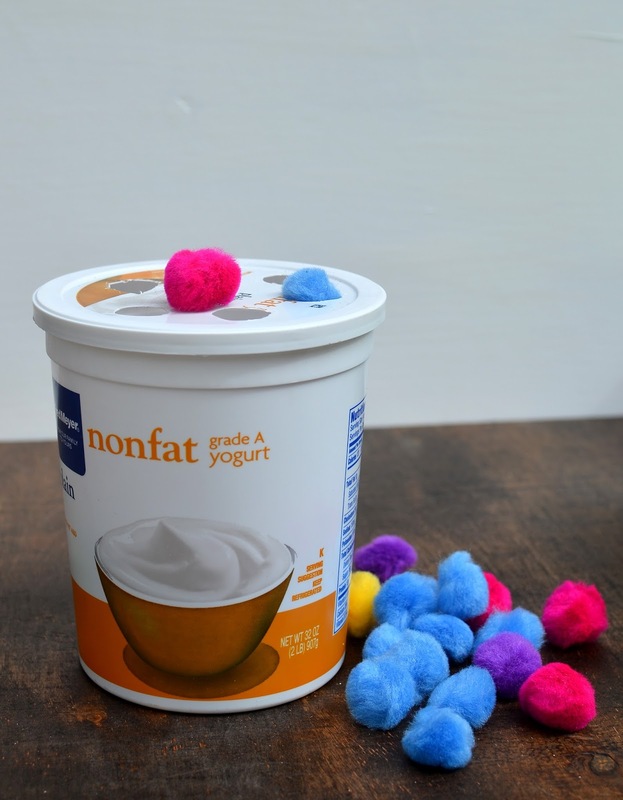 I love them because they were a great hands on activity for both my 2 year old and 4 year old. I saw this some where online and thought it was genius. 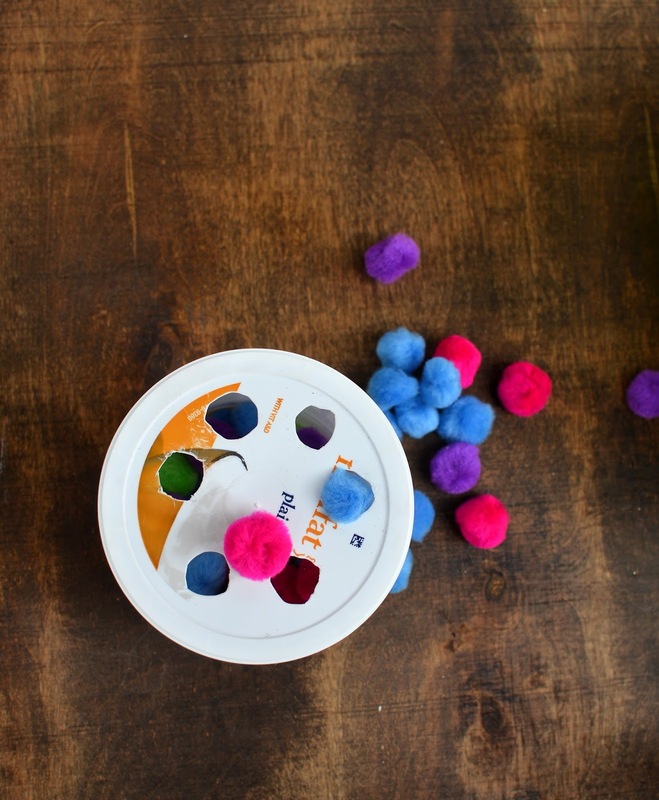 Sweet Cheeks loves to put things in and out of containers and these little balls were fun to squeeze through the cut out holes. 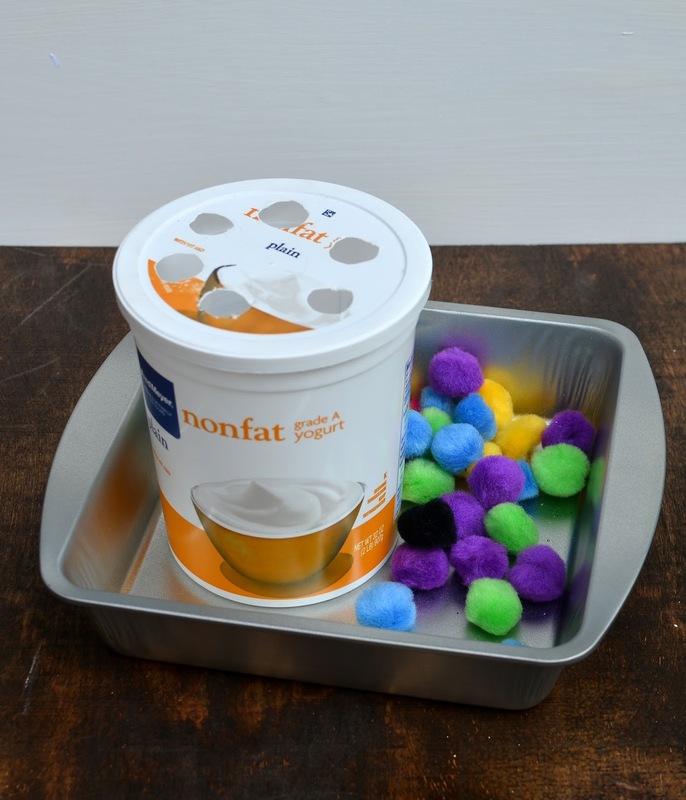 Plus for the car ride I had a dollar store pan for him to pour them out into (which was a great way to keep the puffs contained. Stay tuned this week for the rest of the fun activities.